Heat oven to 350º F. Cut out inside of eggplant, leaving shell. Remove eggplant pulp and cut into cubes. Cook in salted boiling water for 10 minutes. While eggplant is cooking, sauté mushrooms, onion, chile, and garlic in butter or margarine. Stir in flour, salt, and pepper. Add well-drained eggplant, cream, and pimiento. Fill eggplant shell with the mixture. Top with cheese. Bake for about 25–30 minutes, until cheese is melted. 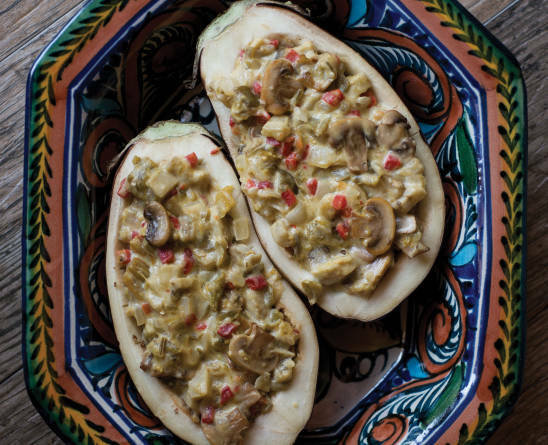 Recipe by Patsy Ogaz Trujillo, daughter of Adrian Ogaz, a cotton and chile farmer in Hatch.